Please note that the above slideshow is automatically created by searching Flickr and does not contain manually curated images. Hence, it is likely that some images may not be exactly of Artocarpus heterophyllus. Please check Binomial Classification section for synonyms. 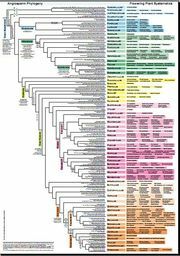 Angiosperm phylogeny. This image is copyrighted. Rights owned by Theodore C.H.Cole (Heidelberg) and Hartmut H. Hilger (Berlin) 2010. Please obtain copyright permissions before reuse. Magnoliophyta Also called Angiospermae. The ancestors of flowering plants diverged from gymnosperms around 245–202 million years ago, and the first flowering plants known to exist are from 140 million years ago. They diversified enormously during the Lower Cretaceous and became widespread around 100 million years ago, but replaced conifers as the dominant trees only around 60-100 million years ago. These are seed plants like Gymnosperms, but can be differentiated by the presence of flowers, seeds containing endosperm and seeds that produce a fruit. Angiosperms are the most diverse and highly evolutionarily successful group of land plants. Magnoliopsida Magnoliopsida is the scientific name for dicots. This class contains about ~1,99,350 species of Angiosperms. Eudicots are a subset of Dicots. Based on chloroplast DNA sequences, the divergence date between monocots and dicots is estimated to be ~200 million years, with a 40 million years uncertainty. Dicots are diverse in habit, with half of all the species being more or less woody-stemmed - a reflection of the usual presence of a vascular cambium in the class. Annuals, biennials, vines, epiphytes, aquatics, parasites, and saprotrophs are also well represented in dicots. Vascular bundles of the stem are usually borne in a ring that encloses the pith. Vessel elements present except in some putatively primitive woody or aquatic families. Most dicots have a primary root system derived from the radicle, although some have an adventitious root system commonly seen in the class of monocots. Cotyledons are usually 2, seldom 1, 3, or 4. Leaves are mostly net-veined. More details can be found in the Binomial Classification section. Is the leaf petiolated or sessile? Is the leaf simple or compound? Is this species native to India? Is the species indigenous/endemic to Sub-Himalayan regions? Is the species indigenous/endemic to Western Ghats? Is the species indigenous/endemic to Eastern Ghats? Does this species have any medicinal use? Names of some medicinal active compounds in this plant, if known. Is the molecular basis of the medicinal action known? Are the toxic effects of consumption of this plant known? Have there been validation/clinical studies related to this plant? Is this plant/plant-derived product used in food preparations? Does this species have any religious significance? Is this plant cultivated commercially in India? This word cloud is obtained using the tool LigerCat by searching the Pubmed database. LigerCat builds the cloud from the most relevant Medical Subject Headings (MeSH) terms. Each term's relative size indicates how many times it appears in the PubMed search results. Click on a term to access the full LigerCat cloud, with live PubMed search capabilities. LigerCat has been developed for the Biology of Aging Project. The page may take some time to load since LigerCat is searching the entire PubMed database and sending us the results in real time. If the number of nucleotide sequences is less than 100, very little genomic work has been done on this species. A respectable number of nucleotide sequences is above 10000. Are herbarium specimen available for this species? This article is a stub. You can help Project Brahma by expanding it. This page was last modified on 23 November 2010, at 19:57.